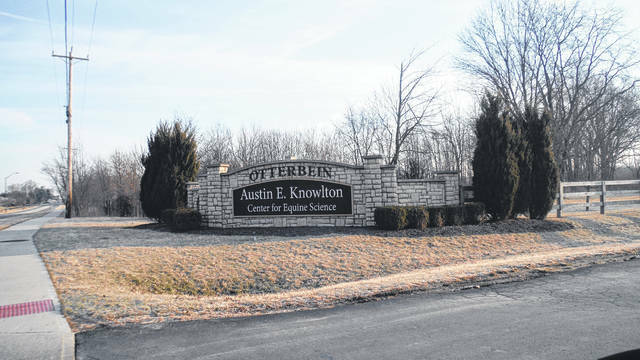 Otterbein University’s Equine Center is in Delaware County. Otterbein’s riding team finished as the Intercollegiate Horse Shows Association (IHSA) Zone 6, Region 2 championship team. We’ve earned a team spot at the Zone Championships on April 6. Additionally we have 11 regional qualifiers (individual riders) who will compete at the Regional Championship show March 30th from 10 a.m.-2 p.m. at Otterbein’s Knowlton Center for Equine Science, 600 North Spring Road, Westerville. The show is open to the public. These individual qualifiers will advance to zone competitions if they finish first or second in their respective divisions at this show. Otterbein has had a very successful regular season and we are looking forward to continuing our success in the post-season shows. No admission. The more people the merrier! Ohio Wesleyan University junior Sloane Baumgartner (Naperville, Ill./St. Francis) and sophomore Brittany Miller (Lewis Center/Olentangy Orange) have been named North Coast Athletic Conference Players of the Week for the week of March 18, it was announced by the NCAC. Baumgartner, an attacker on the Ohio Wesleyan women’s lacrosse team, was named Women’s Lacrosse Player of the Week, while Miller, a member of the Ohio Wesleyan women’s golf team, was named Women’s Golfer of the Week. Baumgartner compiled 16 goals and 5 assists during the Bishops’ 3-game trip to the Pacific Northwest. She scored the go-ahead goal and followed with an assist during a 4-0 run that put Ohio Wesleyan ahead to stay in an 11-6 win over Puget Sound, and led the Bishops with 5 goals and 2 assists. Baumgartner then had 3 goals and 2 assists during a game-opening 9-1 run that started Ohio Wesleyan on its way to a 17-4 win over Pacific, and finished with 4 goals and 3 assists. She then scored twice during a first-half 4-1 run and had 3 goals during a 4-1 run to open the second half as Ohio Wesleyan pulled away for a 15-9 win over Linfield. She finished with 7 goals, tying for fifth place on the OWU single-game list. The Linfield win was Ohio Wesleyan’s fifth victory in a row, the Bishops’ longest winning streak since the 2008 squad reeled off wins in its last 5 regular-season games and 2 games in the NCAC tournament. The triumph also raised Ohio Wesleyan’s overall record to 6-1, the team’s best start since the 2012 Bishops also opened the season by winning 6 of their first 7 outings. Miller tied for 15th place among individuals with a 176 at the adidas Intercollegiate on Monday and Tuesday, helping Ohio Wesleyan to a fourth-place finish in the 7-team field. At the BrownGolf Intercollegiate on Friday and Saturday, she tied her career best with an 84 in the first round, then shot a career-low 83 in the second round to finish at 167. She finished seventh in the individual standings, her career best in a tournament setting, and her 36-hole total of 167 also established a career best as Ohio Wesleyan finished fifth in the 8-team field. https://www.sunburynews.com/wp-content/uploads/sites/48/2019/03/web1_Otterbein-s-Equine-Center.jpgOtterbein University’s Equine Center is in Delaware County. Information for this story was provided by the universities.